All About That Bass (Meghan Trainor) • Billie Jean, PYT (Michael Jackson) • Blurred Lines (Robin Thicke) • Boogie Oogie Oogie (A Taste of Honey) • Born This Way, Edge of Glory (Lady Gaga) • Brick House (The Commodores) • Cake by the Ocean (DNCE) • California Gurls (Katy Perry) • Can’t Feel My Face (The Weeknd) • Car Wash (Rose Royce) • Crazy (Gnarls Barkley) • Crazy in Love (Beyonce) • Disco Inferno (The Trammps) • Ex’s and Oh’s (Elle King) • Forget You (Cee Lo Green) • Get Down Tonight (K.C. & the Sunshine Band) • Get Lucky (Daft Punk) • Good Times (Chic) • Groove is in the Heart (Deee Lite) • Hella Good (No Doubt) • I Gotta Feeling (Black Eyed Peas) • I Want You Back (Jackson 5) • I Want Candy (Bow Wow Wow) • I Will Survive (Gloria Gaynor) • Just a Girl (No Doubt) • Let’s Go Crazy, Kiss (Prince [Tom Jones Version]) • Play That Funky Music (Wild Cherry) • Problem (Ariana Grande) • Sexyback (Justin Timberlake) • Shake It Off (Taylor Swift) • Sweat-Everybody Dance Now (CC Music Factory) • Sweet Caroline (Neil Diamond) • Teenage Dream (Katy Perry) • Treasure, Uptown Funk (Bruno Mars) • You Should Be Dancing (The Bee Gees) • Another One Bites The Dust (Queen) • Any Way You Want It, Don’t Stop Believin’ (Journey) • Enter Sandman (Metallica) • Fight for your Right [To Party] (Beastie Boys) • Highway to Hell, You Shook Me [All Night Long] (AC/DC) • I Love Rock ‘n’ Roll (Joan Jett) • Jessie’s Girl (Rick Springfield) • Living on a Prayer (Bon Jovi) • Paradise City (Guns ‘N’ Roses) • Pour Some Sugar on Me (Def Leppard) • Rebel Yell (Billy Idol) • Sister Christian (Night Ranger) • Sweet Child O’ Mine, Welcome to the Jungle (Guns ‘N’ Roses) • Suffragette City (David Bowie) …and many, many more! Simply the San Francisco Bay Area's sweetest party band! 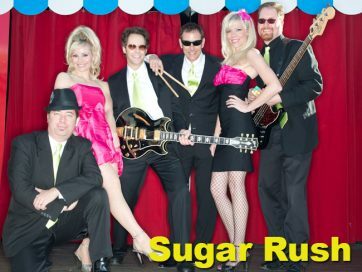 Sugar Rush brings infectious energy and huge fun to every dance floor! With an incredible songlist that includes crowd favorites from "Back Then" 'til "Right Now", Sugar Rush takes your fun seriously! Great players, great singers, great tunes, all topped with a sweet and sassy attitude! "We're hot, and sweet, from our heads, to our feet!" Candy-Coated yet featuring zero calories & tons of FUN... Sugar Rush is the sweetest choice for your best friend's wedding and even for your Boss's upcoming Corporate Retreat, backyard BBQ or Holiday X-Mas Gala! You invite the Guests & we'll bring the SUGAR... anywhere, anytime!